Cooking salmon on a plank over a live fire gives it a tasty smokey flavor. Cooked to perfection it’s then served with a garlic and dill infused butter sauce. Salmon is a delicate fish that does well when lightly smoked and gently seasoned. Cooking it on a plank over a live fire gives it a great smokey flavor while letting it hold its shape. The seasoned sauce is made ahead of time, to infuse as much garlic and dill flavor into the butter as possible. This can be done a day ahead of time, refrigerated, then reheated before using. 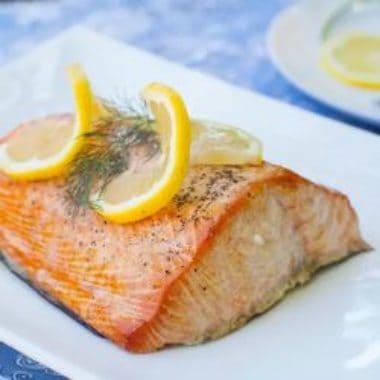 This dish can be as easily made with fresh-caught salmon around the camp, as it can be made in the backyard for a family picnic. Serve it with crusty bread, a green salad, and fresh grilled corn on the cob. In a heat proof dish add the butter, garlic, dill and salt. 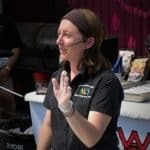 Place in the BBQ and melt, but do not boil. The longer this can infuse, the stronger the flavors, minimum of 20 minutes. Preheat the smoker to 125 degrees C (250 degrees F). Lay the salmon on a cooking safe plank of wood, such as untreated alder wood. Brush the salmon with the flavored butter then add to the smoker. Cook for 40 minutes, checking every 10 minutes, and basting with the butter each time. The salmon is cooked when it gently flakes away when pulled. Serve the salmon drizzled with some of the seasoned butter and garnished with lemon and dill. Serve the remaining seasoned butter on the side. 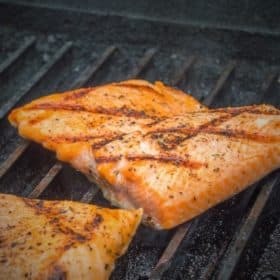 This basic Fried Salmon recipe that can be used while camping. Frying can be done in a skillet over a campfire, on a flat plated BBQ or even a a gas stove. Quesadilla’s are a great camping option, this is a simple yet elegant version uses Smoked Salmon. Best bit it doesn’t need a lot of cooking, just toast the tortillas, then assembled.